We were invited to a ‘H’ themed housewarming which was on last night. 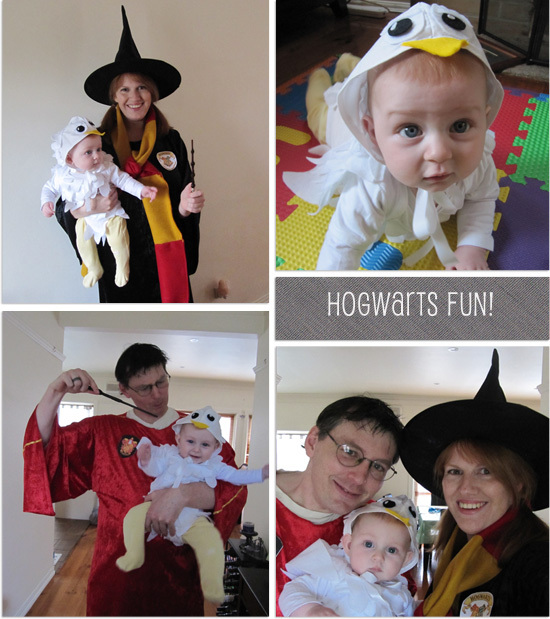 I love making costumes and seized the opportunity to make costumes for all three of us. Col aka Harry Potter on his way to play Quidditch. The robe is made from crushed velvet which has to be one of the worst fabrics on the world to sew. I used to make a lot of crushed velvet skirts back in my uni days; what was I thinking? Me aka a Hogwart’s Student (Ginny, but I had to get around the H-theme somehow!) I’m in a crushed velvet robe, and a scarf made from sewing felt end on end. The hat was purchased. Elijah aka Hedwig. His costume was the most satisfying. I used a romper and sewed layers of felt ‘feathers’ to it. The head piece is a bonnet with the face at front and more felt feathers on the back. If I were to make the costume again I’d rethink the yellow beak and go with grey as once we put the yellow pants on to keep him warmer he did look a bit like a chicken (I’d go with white pants too). The badges are just images printed onto cardstock and glues to brooch backs. My hat and the wands were from Spotlight. All in all I was very pleased with the result and the party itself was lots of fun. Amazing outfits – well done! !